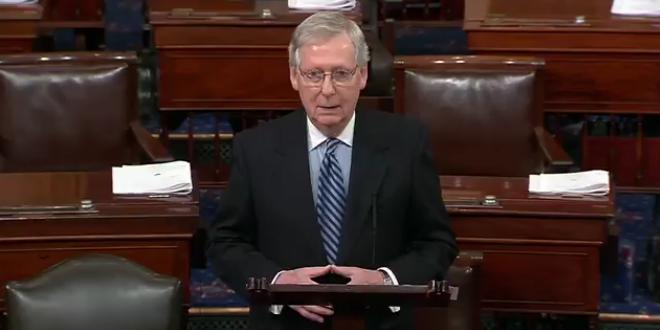 McConnell Unveils Deal To Avert Another Shutdown - Joe.My.God. Senate leaders have reached an agreement on a two-year budget deal, adding billions of dollars in federal spending. The bipartisan accord would lift statutory budget limits by more than $200 billion, provide tens of billions of dollars in disaster relief funding. Senate leaders unveiled the deal Wednesday after months of negotiations — and after Senate Democrats agreed to set aside immigration policy demands. The plan still faces head winds — particularly in the House, where conservative Republicans are balking at the increased spending and liberal Democrats want further assurances on immigration. The announcement came as Congress faces yet another government shutdown deadline of Thursday at midnight. House Democratic Leader Nancy Pelosi said in a statement that she would not support an emerging Senate budget deal that would avoid a government shutdown until House Speaker Paul Ryan commits to a vote on an immigration deal as well. Pelosi said that while the budget deal contains “many Democratic priorities,” leadership would not urge members to vote for it until Ryan pledges to allow a bill to come to the floor that would codify the Deferred Action for Childhood Arrivals immigration program. In addition to helping our military and #Veterans, this bipartisan agreement will provides funding for disaster relief efforts. Last year, powerful storms crippled #PuertoRico & #USVI and damaged communities from #Florida to #Texas, this bill will get more help on the way. The bipartisan budget agreement will fund new grants, prevention programs, and law enforcement efforts in vulnerable communities across the country struggling against the #opioidcrisis and substance abuse.